Photo: Governor Andrew Moore House, ca. 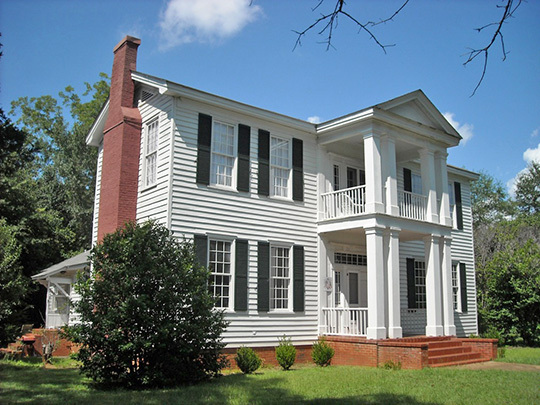 1830s, Marion, AL. Listed on the National Register of Historic Places in 1971. Photographed by user:	RuralSWAlabama, 2009, (own work) [cc-by-3.0 (creativecommons.org/licenses/by/3.0)], via Wikimedia Commons, accessed December, 2014. The Perry County Courthouse is located at 300 Washington Street, Marion, AL 36756; phone: 334-683-9061. Jeff Mansell, Cahaba Trace Commission, Marion Courthouse Square Historic District, Perry County, AL, nomination document, 1994, National Park Service, National Register of Historic Places, Washington, D.C.